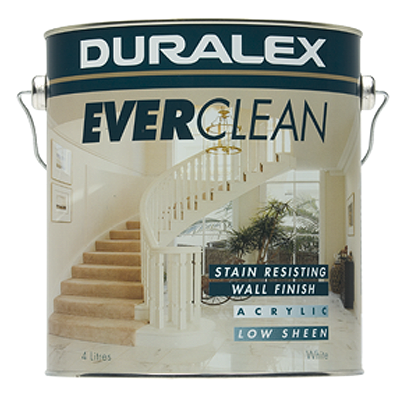 Duralex EVERCLEAN is an interior/exterior 100% acrylic, low sheen wall paint. Duralex EVERCLEAN has the added advantage of being the most advanced stain resistant house paint on the market and supported by university tests. Walls and ceilings; high traffic areas such as kitchens, hallways, stairways and living rooms, etc. Coverage A maximum of 16m² per Litre. This may fall below 10m² per litre when painting corrugated, rough or absorbent surfaces. Ventilation Allow adequate cross ventilation when painting indoors during and after use to dissipate water vapour. Note: Mechanical ventilation is required if painting in an area without open windows. Clean Up Do not pour left over paint down the drain. See “Cleaning up after painting” for industry standard. Wash all equipment with clean water. Any dried spots may be removed using methylated spirits.